Arcoroc Matiz Cutlery is manufactured from 18/10 stainless steel. 18/10 restaurant cutlery has a brilliant shine, it is extremely durable, plus commercial cutlery made from this grade of stainless steel has terrific rust and corrosion resistance. This range of Matiz catering cutlery has a pleasing pear drop design in a serviceable 2.5mm gauge. Each piece of Matiz cutlery is perfectly balanced and perfect in proportion which aids your guests dining experience. This collection of Arcoroc restaurant cutlery features all the pieces of commercial restaurant cutlery any restaurant could require, featuring items such as dessert forks and dessert knives, as well as dinner forks and dinner knives. Arcoroc Matiz catering cutlery is multi-functional and cost effective and will look great on any table. Arcoroc cutlery in 18/10 is wash resistant and Arcoroc restaurant cutlery also respects catering crockery by avoiding scratches. Designed for intensive use Matiz can be washed in repeated cycles in industrial dishwashers and still look perfect for many years. Just wash, buff and reuse! Arcoroc Matiz Cutlery is part of an extensive range of catering cutlery stocked by Pattersons Catering Supplies. As a leading UK catering cutlery supplier we stock wholesale restaurant cutlery from all the leading brands such as Arcoroc who are trusted throughout the UK for supplying quality cutlery ranges. For all your wholesale cutlery needs browse our online collection and discover a comprehensive range of modern restaurant cutlery for contemporary eateries. 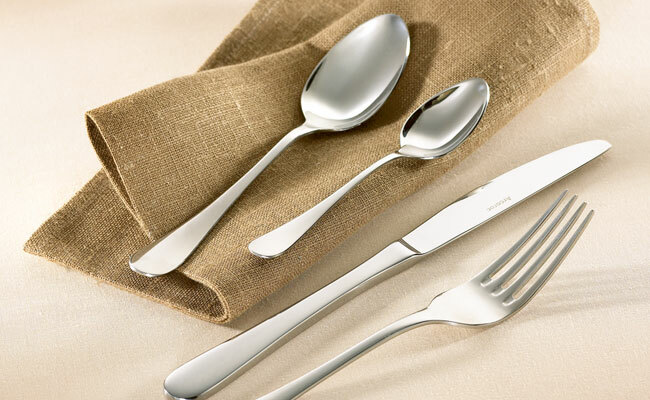 FREE UK delivery is available on qualifying wholesale orders of restaurant cutlery.